We provides scalable client–focused solutions that improve the effectiveness and speed at which projects are completed within organizations and ensures sustainable project performance. We build our clients project management capabilities through on site project management consulting as well as through the development of Project Management Offices (PMO), Project Assessments and Audits and Technology solutions. 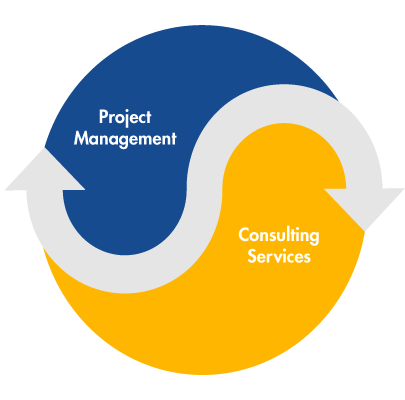 PM Technologies offers world-class project management services increase our clients’ profitability by ensuring projects are completed on-time and on-budget according to customer quality requirements. PM Technologies offers professional project management products to increase corporate project performance. Effective project management improves product implementation timelines, controls costs, and ensures quality standards improving overall customer satisfaction. We have worked extensively with major corporate clients to successfully complete hundreds of strategic projects over the past fifteen years. There is significant value in increasing project management performance levels within corporations, resulting in improved Return on Investment (ROI) of Capital Expenditures. Our “Team Approach” is the cornerstone of PM Technologies’ management philosophy. We accomplish our clients’ goals by becoming an extension of the clients’ organization, providing the expertise necessary to ensure project time, cost and quality objectives are met or exceeded. Our team has managed hundreds of strategic projects and implemented Project Managements Offices for Fortune 500 companies. We utilize a proven project management methodology and state-of-the art tools and technology to manage our clients’ projects. Our best practices methodology is closely aligned with the Project Management Institutes “Project Management Body of Knowledge” or PMBOK guide. Our consultants are highly skilled in the art and science of project management and have extensive experience managing projects in leading industries. Precise execution of your projects and corporate initiatives is crucial to the health of your entire organization. The consequences of project failure are grim. Our highly seasoned PM Technologies certified professionals will help you maintain focus on critical project activities to attain frequent, tangible, and repeatable results.